Just Once Multivitamins provide daily nutritional support plus a broad range of antioxidants in just one tablet per day. Specially blended superfoods and essential nutrients promote increased energy and long-term health. * Just Once is vegetarian and vegan, and is guaranteed to be 100% free of animal products throughout every stage of the production process. It is gluten-free, sugar-free, lactose-free, dairy-free, wheat-free and yeast-free. It is 100% natural and contains no artificial colors, flavors, sweeteners, preservatives or additives. Plant-source enzymes ease digestion, making it gentle on the stomach. 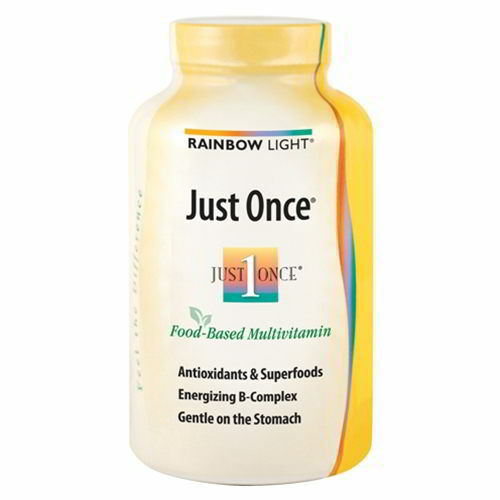 * Also available without iron for post-menopausal women and others who prefer or require no iron (see Just Once® Iron-Free Multivitamins). Contains essential vitamins and minerals in potencies that deliver optimal short- and long-term health benefits, and antioxidant protection. 400 IU of vitamin D2 promote healthy bones and teeth, and antioxidants including 240 mg of vitamin C and 5,000 IU of vitamin A support skin, eye and immune health. Potent vitamin B complex provides energy and stress support. Superfood Energy Complex contains chorella and organic spirulina, plus concentrated extracts of eleuthero, ginkgo and stinging nettle, to provide added nutrition and energy, and promote enhanced absorption and digestion of co-nutrients. * A custom blend of plant-based enzymes enhances digestion without taxing your system or causing stomach upset. Just Once is VeganGuard guaranteed to be free of animal products. It is gluten-free, sugar-free, lactose-free, dairy-free, wheat-free and yeast-free. It is 100% natural, containing no artificial colors, flavors, sweeteners, preservatives or additives. For comprehensive daily nutrition and antioxidant protection, take one each day, with or between meals. Other Ingredients: (natural mineral and or vegetable): source cellulose, stearic acid, modified cellulose, magnesium stearate, silica. Coating: dextrin, dextrose, soy lecithin, carboxy methyl cellulose, sodium citrate.